Property rights defined by points on the ground were once believed to extend indefinitely upward. This notion remained unchallenged before air travel became popular in the early 20th century. To promote air transport, legislators established a public easement for transit at high altitudes, regardless of real estate ownership. Both the public easement in the space at these higher altitudes and landowner rights to the exclusive use of the airspace at lower altitudes have been well documented by the U.S. judiciary. In the United States, the Federal Aviation Administration (FAA) has the sole authority to regulate all "Navigable airspace", exclusively determining the rules and requirements for its use. Specifically, the Federal Aviation Act provides that: "The United States Government has exclusive sovereignty of airspace of the United States" and "A citizen of the United States has a public right of transit through the navigable airspace." The "navigable airspace" in which the public has a right of transit has been defined as "the airspace at or above the minimum altitudes of flight that includes the airspace needed to ensure safety in the takeoff and landing of aircraft." However, this does not authorize the United States Government to operate aircraft with impunity in regards to "substantial impairment" of private property, which constitutes a governmental taking requiring just compensation. The exact altitude(s) at which the airspace over private land can become subject to "substantial impairment" is often debated. Case law in the past has used the height of 500 ft (150 m) in urban or suburban areas, and 360 ft (110 m) above the surface or tallest structure in rural areas as the demarcation of where impairment of property rights can occur. At those times this constituted the limits of "navigable airspace". However, the bulk of more recent decisions, which take precedent, hold that taking can occur regardless of if the flight occurred within navigable airspace or not and only impairment of property need be considered. This is especially important as some aircraft (manned and unmanned) now have no minimum flight altitudes making virtually all airspace "navigable". The FAA is required to pay financial compensation to property owners when their property interests are taken for overflights (when federal government is the taking party ). Compensated landowners may then be required to waive any putative damages for interference with "air rights" in order to avoid lawsuits from future owners' nuisance claims against low flying aircraft. This is called a navigation or navigational easement. Congress has provided authority for the FAA to provide funds to purchase these easements near airports to accommodate planes taking off and landing. The owner of the land has the exclusive development rights in the 'space' above his lands. Under common law, building a 'hangover' that breaks the vertical plane of a neighbor's property is a trespass and the property owner has the right to remove the offending structure. The airspace is property and retains developmental rights which can be sold or transferred. Thus in a dense downtown area, each building in the area may have the right to thirty-five stories of airspace above his own property. 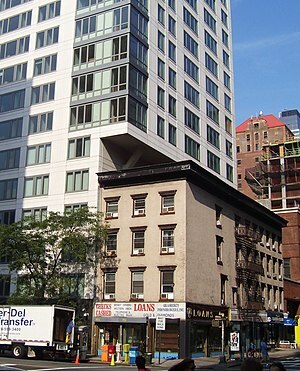 In one possible scenario, owners of an older building of only three stories high could make a great deal of money by selling their building and allowing a thirty-five-story skyscraper to be built in its place. In a different scenario, a skyscraper developer may purchase the unused airspace from an adjacent landowner in order to develop a broader building. In November 2005, Christ Church in New York sold its vertical development rights for a record $430 per square foot, making more than $30 million on the sale for the right to build in the space over its building. ^ 49 U.S.C. 180, 49 U.S.C.A. 18, § 40103 "use of airspace"
^ "49 U.S.C. 40103(a)(1)". Retrieved 2009-04-07. ^ Branning v. United States 654 F.2d 88 (Fed. Cir. 1981) Held a taking occurred from air travel inside of navigable airspace (600') The present case is a case, as the court foresaw in Aaron v. United States, 160 Ct.Cl. at 301, 311 F.2d at 801, in which "the unavoidable damage [reduction of the highest and best use] to a person's property occasioned by [the noise created during] travel in the navigable air space [is] so severe as to amount to a practical destruction of it." This is a case of first impression in which the court may consider the altitude of the flights over the property, but must give primary consideration to the effect of aircraft noise where the Government itself has adopted and published standards of compatibility of use of the subjacent property. Since the subjacent property owner has suffered a diminution of the value of the property in this case, there has been a taking of an easement over and through the airspace subjacent the property of the plaintiff. It is abundantly clear that under the law established by Causby, Griggs, and Aaron a taking has occurred in this case. ^ Griggs v. Allegheny County, 369 U.S. 84 It is argued that though there was a "taking," someone other than respondent was the takerthe airlines or the C. A. A. acting as an authorized representative of the United States. We think, however, that respondent, which was the promoter, owner, and lessor of the airport, was in these circumstances the one who took the air easement in the constitutional sense. ^ Branning v. United States, 654 F.2d 88, 97-98 (Ct. Cl. 1981, Aaron v. United States, 311 F.2d 798, 801 Ct. Cl. (1963); Brown v United States 3 F.3d 1100 Ct Cl. (1996). ^ Fuller, Ernest (December 9, 1955). "Dedicate New Prudential 41 Story Building". Chicago Tribune. Retrieved September 7, 2017. ^ McCown, James (September 4, 2002). "Boston Air Rights". Architecture Week. 113 (4).